Quality can be had on a budget. Less expensive guns are usually cheap, meaning they are unreliable and of low quality, so when an inexpensive gun comes along that won't break before it is broken in and works correctly every time the trigger is pulled, it is noteworthy. When it comes in a major caliber and doesn't bite the shooter's hand when fired, it is even more so. I think Cobra Enterprises may have just such a noteworthy handgun. The Cobra Patriot .45 ACP is an economically priced polymer-framed handgun with stainless steel slide and barrel. Given its size, the author would call it a compact. It is a simple gun with few controls. The Patriot that I received for testing is a double-action-only, striker-fired, polymer-framed pistol with a stainless steel slide and barrel and a seven-round, single-stack magazine. Six- and 10-round magazines are also available. Made entirely in the U.S., it is a simple gun with no external controls except the magazine release. The rear sight is a blued notch in a dovetail that is adjustable for windage, and the front is a stainless steel ramp machined into the slide. The slide rides on polymer rails, not on metal inserts, which are common on many polymer-framed handguns. Although the expected life of the gun is unknown, Cobra reports firing more than 30,000 rounds through one of its test guns and it is still in use. The polymer grips are heavily checkered, offering a good non-slip surface, and the magazine release is a square button located on the left side of the gun just aft of the triggerguard in the customary American style. The blued-steel magazine has witness holes, a metal follower and a polymer baseplate. The gun weighs 20 ounces unloaded and is 4 3/4 inches high and one inch wide. The slide is machined from a casting and has a matte, natural finish with no sharp edges. The serrated trigger broke at 14 1/2 pounds after a fairly long pull and considerable stacking. The three-inch barrel has an integral feed ramp, a fully supported chamber and a slotted underlug that rides on the takedown pin. The gun is equipped with a captive full-length recoil spring and guide. The Patriot has a fairly conventional recoil operation with a cam/ dropping barrel-locking system. There is no slide catch that would increase the price of the gun, so when the last round is fired, the slide does not lock back. Takedown is typical of a modified Browning design. First make sure the gun is unloaded. While holding the slide to line up the takedown notch with the takedown pin, the pin is pushed from right to left and then removed from the gun. As the trigger is pressed, the slide and barrel assembly are allowed to move forward until they clear the frame. The recoil-spring assembly is then lifted from the underside of the barrel-slide assembly, after which the slide and barrel can be separated. Assembly is in reverse order. There is no blocky end-profile with the Patriot. This is actually a pretty nice-looking gun, with the slide contour resembling that of the M1911. The front of the triggerguard is serrated for those who like to grasp it with their off hand. Cobra cautions against firing anything other than standard-pressure ammunition: No +P ammo allowed. The instructions also indicate that only roundnose FMJ ball should be fired; otherwise feeding problems might be encountered. These precautions are understandable in a low-priced handgun. The gun fits the hand very well, and the polymer frame assists in absorbing .45 ACP recoil. The Cobra Patriot proved to be accurate enough for close encounters. I took heed of the warning about high-pressure ammo but did want to see just how much trouble hollowpoints would cause the Patriot. I found that the first and second rounds from a full seven-round magazine would hang up on the feed ramp, but the rest of the rounds would feed without difficulty. Interesting. Ball ammunition worked with no problems. Although I am not suggesting that the user do as I did, I found that the test Patriot suffered no malfunctions if five hollowpoints were first loaded into the magazine followed by two RN-FMJs to top it off. The top of the slide is serrated to reduce glare, and the rear of the slide is generously grooved to assist in racking. This is a simple, striker-fired gun with an external extractor, dovetailed rear sight that is drift adjustable for windage, grooved slide and checkered polymer grip. However, that may not work in all Patriots, and any gun used for self-defense should be thoroughly tested with the ammunition to be carried before putting the combination into service because a self-defense gun must function perfectly each and every time the trigger is pulled. You don't want a jam when you really need a gun to save your life. The Cobra Patriot fieldstrips just like many Browning-modified semiautos. Once disassembled, it is easy to clean and reassemble. No special tools are required. Using a bench rest, I tried testing for accuracy at 25 yards, but not all five shots would hit the 8.5x11-inch target, so I moved a bit closer and tested at 15 yards. The fact that I had to move closer is not necessarily a negative given the sighting system and the fact that most self-defense situations occur at distances of just a few yards or less. Besides, the gun was specifically designed for use at short distances. Velocity recorded 10 feet from the muzzle with an Oehler 35P chronograph. Accuracy tested off a bench rest. Results are the average of three five-shot groups at 15 yards. It turned out that all loads tested proved accurate enough for self-defense, with the largest average group size being 5.29 inches. The smallest average group size was 3.73 inches with Black Hills 230-grain FMJ. 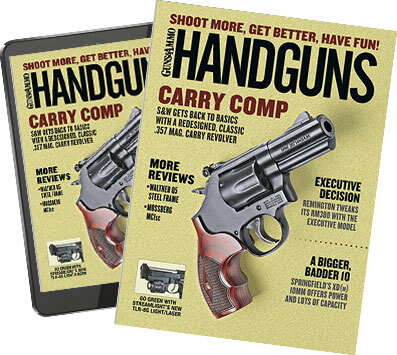 Group sizes were larger than many expensive handguns deliver, but this is a low-cost gun so less attention is paid to the fit of slide-to-frame and barrel-to-slide. More important, the gun functioned reliably throughout the testing except for two instances where the extractor failed to slide over the cartridge rim, preventing the round from chambering. This happened only when racking the slide by hand to load the first round. When the same round that had failed to feed was loaded into the chamber when the gun was cycled by firing, there were no problems. Trigger pull was stiff, and after an extended range session my trigger finger had developed a blister. This may have contributed to some larger group sizes, but it should not be of concern to the owner who may practice occasionally. The grip of the Patriot was large enough to offer a solid grasp, and therefore recoil was easily managed despite the gun's lightweight polymer frame. This became evident when I conducted some rapid-fire testing at seven yards. With proper technique, the gun shot where I intended and recovery from recoil was rapid. If a quality product is defined as one that performs as advertised and meets the specifications called for in manufacture, then I have to declare this test gun to be a quality piece.